Hello knitting peeps and non-knitting peeps. 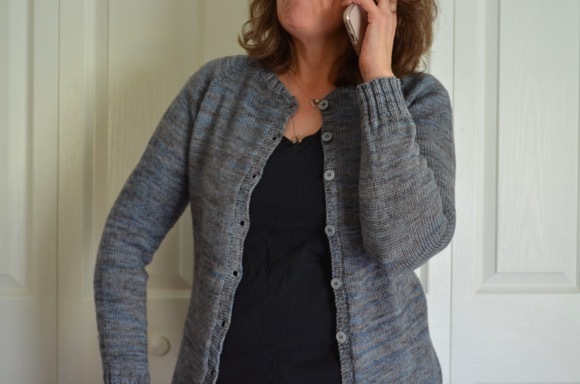 I'm excited to tell you all about my knitting because I am finally (finally!) at the fair isle knitting band before the ribbing of the body of the sweater. Honestly, I'm a little sad that the miles of stockinette are done but I'm thrilled to be nearly finished with the body and so very close to the sleeve knitting. Lucky for me, I love sleeve knitting and how speedy the knitting goes as the stitches are decreased. The husband's socks are not seeing much action. I'm reserving them for babysitting days and lately I haven't had time to knit like I usually do because of inclement weather and starting work at a later date or not going to work at all. I also spend approximately an hour a day on my son's blanket. This is a long term project that is at the ready by my loveseat for TV knitting. Each of those three projects is wonderful, and I imagine that your husband and son are hoping that you finish theirs soon. I'm anxious to see you modeling your beautiful sweater! Hoo-rah for almost being done with the body. I hope to start a FL heel before the month is out. Debating on whether or not to make a few thank you cards for the girls to write in or just make them use their stationary. Woo! That is really excellent on reaching that colorwork point of your sweater! I don't know, but somehow colorwork just seems to go faster for some reason! So exciting, when the sweater is so close to being done! Well, my comment disappeared when I looked at your blanket, so I'll try again. Love the colorwork on your sweater and your color choices as well. That sock yarn is very fun, too. Happy Tuesday! You'll be wearing that sweater so soon! Good for you!!! Socks are the knitting of the day today. I am working on a crocheted baby afghan at the moment - Pink even! It is for a baby girl who is due around the 15th of February. It is such an easy pattern that I can watch a movie or whatever and still add on those rows! Your sweater is looking awesome! Your fair isle sweater is looking amazing! I know what you mean about the stockinette, I love how mindless it is and its perfect for knitting and watching a show. I am currently trying to finish up some fingerless mitts and just finished a fun quick earbud pouch project. Have a good week! I love your sweater and like you I appreciate long stretches of stockinette. Great color on the Afghan. 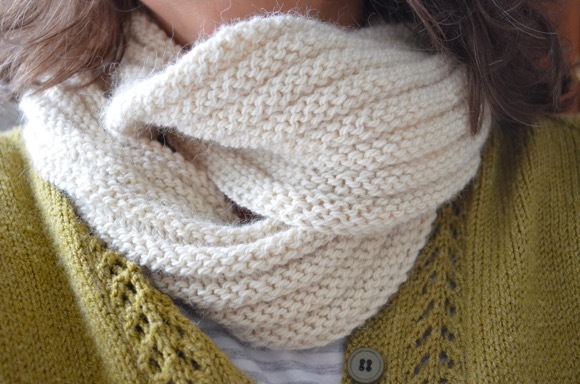 Wool-ease is one of my favorites. You can't go wrong and it holds cables really well. Now about those socks... Very pretty. Oh wow, your sweater is going to be gorgeous. and I love the idea of a TV project. 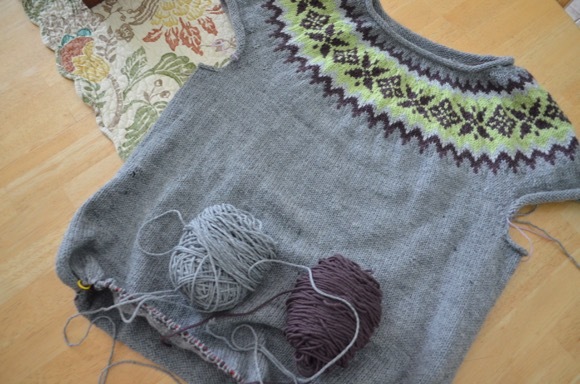 So exciting to be so close to starting the fair isle pattern again, it is so beautiful. The perfect winter sweater. Finishing the body of a sweater is such an exciting accomplishment. Hope you knit the sleeves quickly. I'm dying to see the finished sweater. 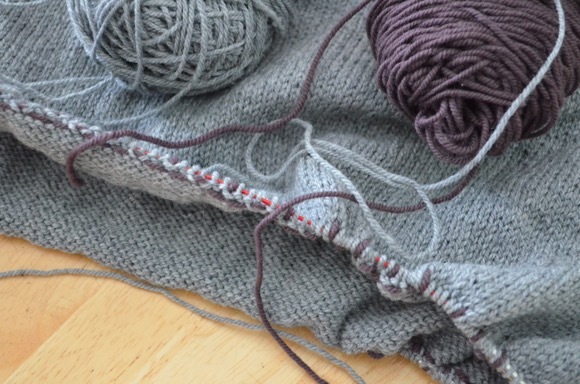 Finishing the body of a sweater always feels like a milestone met. It is going to be so much fun to wear. 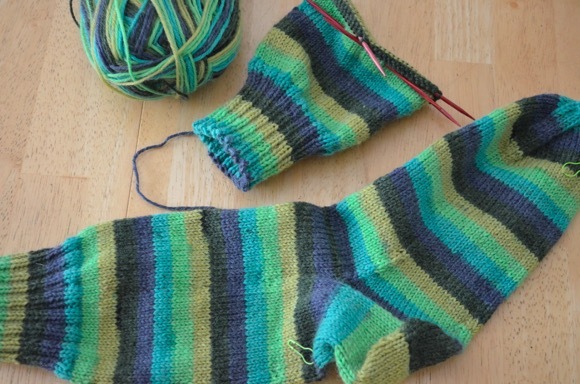 The socks are coming along. Your previous post sounds like the perfect weekend - kids home and filling your life with lively conversation, a musical production, and sleeping in your own bed. Working on the blanket a bit each day sounds like a good plan. i love your love of sleeves. Not me. I usually knit them in the round and get dizzy with tangling yarn. Your sweater is just so lovely. Socks look good too. I finsihed my snood! I will wear it today or tomorrow outside when we are above zero wind chills. IT was fun to knit from lornas laces! Hi Karen, thank you so much for the help with the comments. Yes, clearing the cache and cookies seems to have solved the problem. It’s nice to write a comment and not have it disappear into the internet abyss. Gorgeous sweater! And almost finished!! Your projects are wonderful. Stay warm!